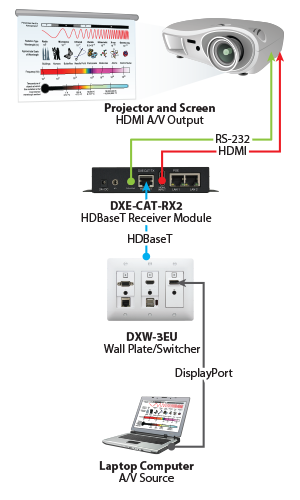 Aurora's DisplayPort HDBaseT Wall Plates - Aurora Multimedia Corp.
Aurora’s DXW-3 Series HDBaseT Wall Plates are the industries only HDBaseT Wall Plate with a native DisplayPort input in addition to HDMI and VGA. Perfect for reliable, cost effective HDMI/VGA & DisplayPort HDBaseT extension within the Conference Room or Classroom. Three models make up the DXW-3 series each offering auto-selectable inputs w/Audio, switchable button override, front panel IR Receiver for display control as well as RS232 programmable control & pass-thru. The DXW-3E adds Ethernet support and the DXW-2EU takes it a step further offering one of the industry’s only HDBaseT Wall Plate supporting true USB 2.0 for use with interactive whiteboards. 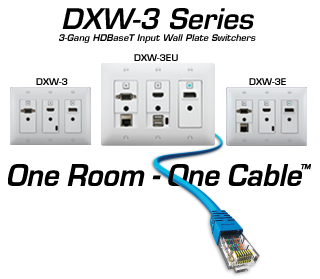 When it comes to Display Control Aurora’s DXW-3 One Room – One Cable™ Wall Plates make it easy. Simply connect your computer to any of the three inputs and the DXW Wall Plate will automatically turn the display ON. When you are done with the meeting simply disconnect the computer or video device from the wall plate and we will turn the display off after a user-defined amount of time (30 sec, 5 min etc…). Front panel buttons can also be used for display control allowing flexibility in user integration. All wall plates are only 1.4” deep allowing them to be installed in floor boxes and table mounts.